Located less than an hour’s drive from Toronto and Niagara, Halton covers over 967 square kilometres, including 25 kilometres of frontage on beautiful Lake Ontario. Halton’s current population is approximately 500,000 and is projected to reach a population of 628,900 by the year 2021, with annual increases fluctuating between 12,000 and 14,000. Oakville and Milton remain to be the two growing communities in Halton, together absorbing between 8,000 and 10,000 new population annually between now and 2021. On the other hand, Burlington and Halton Hills continue to mature with declining annual increases in population. According to the 2006 census figures, immigrants comprise approximately 25% of Halton’s population. In Halton-Peel, approximately 40% of residents have a mother tongue that is neither English nor French. There were considerable differences between Peel and Halton. The proportion of allophones is more than twice as high in Peel (44.3%) than in Halton. The highest proportion of population in Halton speak Polish as their mother tongue. 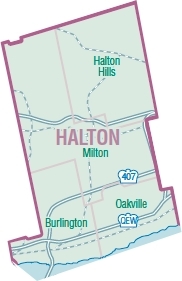 There are four Area Municipalities in Halton Region. Each has its own website which can be accessed by clicking on the map or on the name of the individual municipalities.